EDDIE Hearn says he is hopeful he can secure the signature of Carl Frampton to Matchroom Boxing and believes he can make it worth Frampton’s while with big the big fights he craves. Hearn promoted ‘The Jackal’ in the early stages of his career before the North Belfast man and his then-manager, Barry McGuigan split from the Matchroom boss and Sky Sports to form Cyclone Promotions following Frampton’s European title win over Kiko Martinez in February 2013. However, despite the hostility shown to him by Frampton since, Hearn believes he can do a job with the Tiger’s Bay man who confirmed his split from Cyclone and the McGuigans last week. 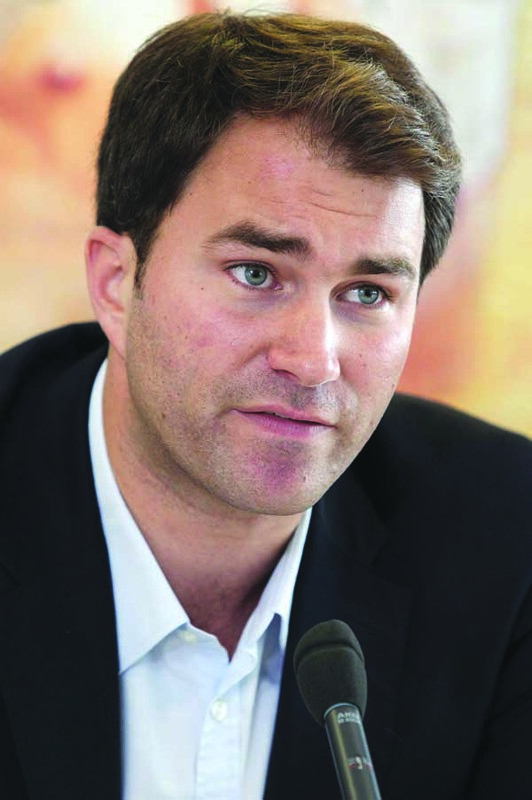 “I am 100 per cent sure I will talk to Carl Frampton,” said Hearn at the Europa Hotel yesterday. “If he is going to talk to promoters, then he has to talk to me. It would be quite a turnaround, especially when the build-up to Frampton’s super-bantamweight unification in February 2016 against Scott Quigg is taken into consideration. In the press conferences promoting that fight, Frampton’s disdain for Hearn was evident, but given the clout the Englishman can bring, a return can’t be ruled out. Speculation has mounted since Frampton announced his departure from McGuigan just who he will link-up with and he will not be short of suitors given his popularity and pulling power and Hearn wants to be given the chance to make his case to the 30 year-old. “I want to be one of those people he talks to,” he confirmed. “I don’t think he is necessarily in a position to start talking about deals. There have been no talks about deals with him. An ambition for Frampton is to box at Windsor Park before his career is over and Hearn could be the man to deliver given he secured a Goodison Park date for Tony Bellew, a Bramall Lane title defence for Kell Brook and two Wembley blockbusters, while he looks set to announce the Principality Stadium in Cardiff for Anthony Joshua’s next title defence. Matchroom have proven they can put on these stadium fights and with the power of Sky Sports and more importantly, Sky Box Office behind him, Hearn is convinced he can not only deliver Windsor Park for Frampton, but the trilogy fight against Leo Santa Cruz on home soil too. “If he’s a free agent, I want to sign him,” he reiterated. “That’s all I can tell you and I can deliver for him. I believe he’s a box-office fighter. I never got the opportunity to finish the job when I was with him last time and I want to finish the job this time. “I can bring Leo Santa Cruz here, I can do Windsor Park, I can do all those things, but we’ll see.